Give employees a feeling of cool well-being with our cooling equipment – they are environmentally-friendly and portable. They reduce the temperature by an average of 7 degrees, making work spaces and waiting rooms more comfortable for staff and for clients. Studies show that the productivity of the work-force increases in a cool working environment. The equipment works with a small amount of water and 220v. of electricity, which means it runs for less than 1€ per day. It is easy to maintain, and both the machine and the water tank can be moved to cool overheated areas in your factory, warehouse or storage areas, eliminating the need to install air-conditioning units. The equipment can work for up to 8 hours without needing to be connected to a water supply. All our units are portable and do not require installation. Test it out! 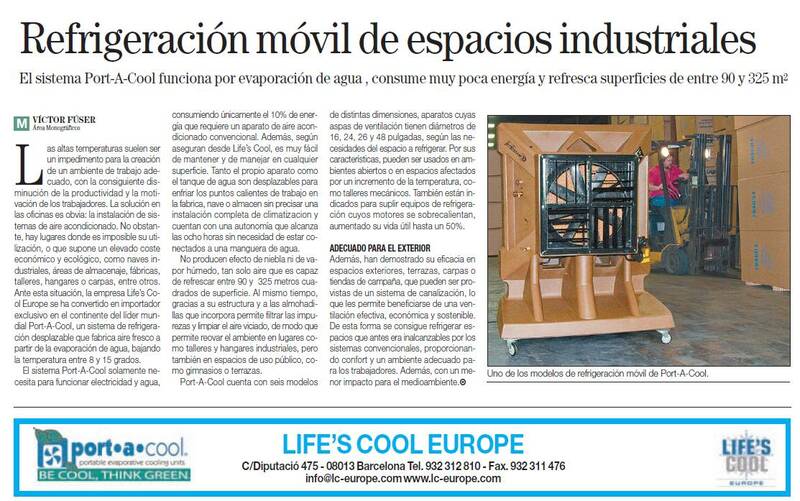 To read our article on portable coolers for industrial spaces published in La Vanguardia, click here. Cooling for spaces which were previously out of reach for conventional systems, providing comfort and a good working environment for staff and creating less impact on the environment. Keeps repair shops cool or even cools an entire hanger. The suffocating heat of summer can complicate the task of maintaining airplanes, but the Life’s Cool units can reduce the temperature by an average of 7 degrees. Use hangers all year round thanks to the Lc-Europe cooling units, and keep doors and windows open for better results. The units work with a small amount of water and 220v. of electricity. They are portable to make it easy to cool any space. Don’t hesitate! Tell us what space you need to cool – click here or write to us at info@lc-europe.com and we will advise you. Enjoy the open air and a cool atmosphere with LC-Europe – now it’s possible! Athletes recover better if the temperature is reduced by an average of 7 degrees. No humidity, just fresh air! The units work with small amounts of water and 220v. of electricity. Our machines provide more than 8 hours of cooling and fresh air without needing to be connected to a hose. All our units are portable, making it easy to cool any area. What space do you need to cool? Contact us! Read more information about portable, environmentally-friendly cooling in our BLOG. An innovative and responsible way to cool your spaces. Open-air events or marquees, those spaces both exterior and interior that were previously impossible to cool. The suffocating heat of summer can leave terraces and open-air spaces unusable but with LC-Europe units you can reduce the temperature by an average of 7 degrees. They work with just water and 220v. of electricity. No installation required. LC-Europe offers evaporative coolers for sale or rent throughout Spain. The units need no installation and are portable so they can be moved wherever the temperature needs to be reduced. Your summer event will be a success with our wide range of evaporative coolers. Make a difference, keep cool in an innovative and responsible way. Don’t hesitate to contact us if you have any questions, and we can offer advice on what you need. Read more about portable, environmentally-friendly cooling systems on our BLOG. Provide a feeling of well-being and coolness for your workforce with our portable, environmentally-friendly cooling units. They reduce the temperature by an average of 7 degrees, making work spaces and waiting areas more comfortable for employees and clients. Studies show that workers’ productivity increases in a cooled atmosphere. LC-Europe systems use 10% of the energy required by conventional air-conditioning units. They don’t produce fog or damp vapour, just air which can cool an area between 90 and 325 m2 and, at the same time, filter impurities and clean stale air, refreshing the atmosphere in places such as work-shops and industrial hangars or public spaces like gymnasiums and terraces. Portable cooling units have shown their efficiency in exterior spaces, terraces, marquees and tents, creating effective, economical and sustainable ventilation. They cool spaces that were previously out of reach for conventional systems, providing comfort and a suitable atmosphere for workers, while creating less impact on the environment. Contact us now! We’ll advise you on what you need. Cools animals and their stalls for just a few cents a day. Cools feeding areas, barns, stables and production areas. Creates a ventilation tunnel to cool barns and closed areas. Our cooling units operate with just water and 220v. of electricity. They are environmentally-friendly and do not emit harmful fluorocarbons. Our Life’s Cool 48” model, which can cool approximately 371m2, is an excellent example of functionality. Ideal for summer and hot periods or places! Increases milk production in cows. According to studies carried out by the Department of Animal Sciences, Kansas State University, Journal of Dairy Science, 86. Published 2003. What space do you need to cool? Contact us and we will advise you on what you need. Makes training grounds, artillery areas and other places where the heat can limit or hinder activity, both indoors and out, more comfortable for personnel. Reduces the temperature by an average of 7 degrees. Cools spaces that were previously out of reach for conventional systems, providing a suitable, comfortable atmosphere for the workforce while creating less impact on the environment. Cool these spaces, which was previously impossible, with our innovative, portable and environmentally-friendly units. Enjoy cool, pleasant terraces all summer long, using only water and electricity. No installation required and they are environmentally-friendly. The suffocating heat of summer can limit the use of open-air terraces, but the LC-Europe units can reduce the temperature by an average of 7 degrees. All the units are portable, making it easy to cool any area. Why not have one in your home? Our units cool areas of between 50 and 325 m2 using water evaporation with responsible energy consumption. COPYRIGHT LC-EUROPE. All rights reserved 2016.